In the Holy Eucharist, Jesus Christ fulfills His promise to the Church: “I am with you always, to the close of the age” (Matthew. 28:30). The Holy Eucharist is commonly known as the “Mass”. Please join us every weekend and throughout each week for the celebration of the Holy Eucharist. While only Catholics in “good standing” are able to receive the Holy Eucharist, we invite everyone to worship God during Mass and experience the power of Christ’s presence in the liturgy. The Mass follows a “fundamental structure which has been preserved throughout the centuries down to our own day” (no. 1346 Catechism of the Catholic Church). If you would like to understand more about the parts of the Mass please click the USCCB link click here. Whenever there is no sacramental priest available at Holy Trinity Parish to celebrate the Eucharist during the weekdays, the faithful have an opportunity to gather at the Eucharistic Chapel for the Liturgy of the Word with the distribution of the Holy Eucharist presided by commissioned Lay Leader of Prayer. It is essential to include in our Eucharistic gatherings those who for the reasons of an illness may not gather with us at the altar. At the end of each Mass an individual may be sent forth to bring the Eucharist to those who are homebound and sick. It is a moment of profound prayer, inclusion and compassion shared between us as brothers and sisters in Christ. If you wish to bring the Eucharist to a person who is homebound or sick please come in the sacristy prior to the Mass celebration. You may bring your own pyx or the parish will provide you with one in order to carry the Eucharist in the most reverent way. The pastor will instruct you on the proper way how to conduct yourself in this ministry. CTNY WFMJ Sunday 6:00 a.m. Spectrum (Charter/Time Warner) Ch. 50 Sunday 6:30 a.m.
DirecTV Ch. 305 Sunday 6:30 a.m. Dish Network Ch. 250 Sunday 6:30 a.m. Going on vacation does not mean “skipping” Mass! With a little planning, you can find a Catholic parish in or near almost any location. By telephone, you can call the chancery of the diocese or archdiocese you will be in and request information on local parishes. Going online will provide all the information you need. You can go online to https://masstimes.org, or in myParish App. This provides a link to parish and/or diocesan websites or church locations and contact information. Simply enter a zip code, city, state, country or area code for Catholic parish/church locations. 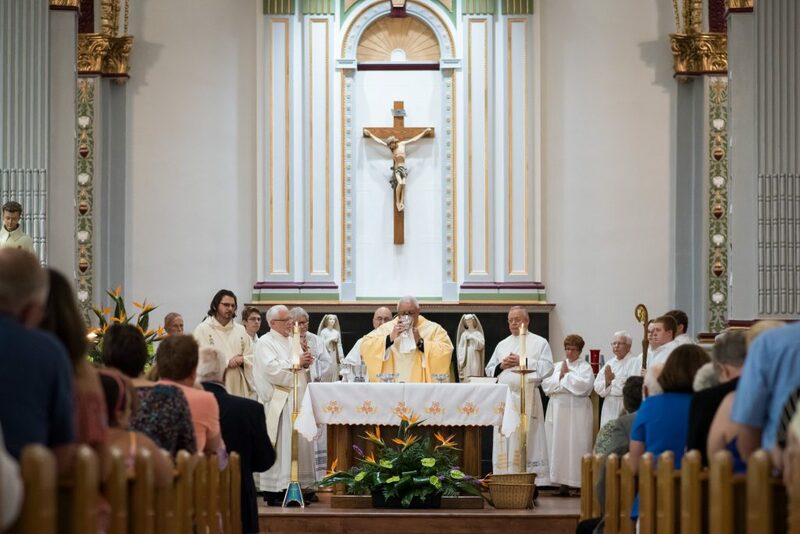 For further reading on the essence, beauty, and the importance to celebrate the Holy Eucharist within a faith filled community click here.